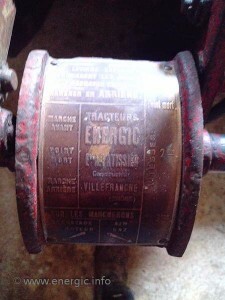 All Energic motoculteurs and Moto-winches operate the same lever controls for the wheel clutches, direction (inverse) and gears.The operators indicator plaques where made from Copper and aluminium, depending on the type and age of the machines.These plaques showed positions forward and reverse with 2 neutrals between and 3 gears depending upon the model. 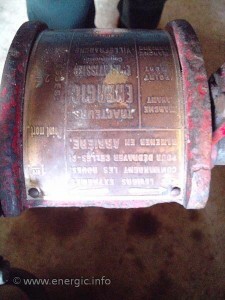 Energic motoculteur B5 one lever plaque, showing inverse direction and stop. The first Energic motoculteurs type B used just 3 levers, as there was no reverse gear, with the gear box permanently in 1 forward gear giving the B motoculteurs the top speed of 4kph. In later upgraded B5 models there was a reverse gear added. Energic motocyulteurs C7 & D9 2 lever plaques, showing inverse direction and stop. The other side select 3 gears. Energic C7 and D9 motoculteurs used 4 levers. The forth being the selection of 3 gears (center right from the operators position). Which gave the following speeds; 1st gear kph, 2nd gear kph and 3rd gear kph. 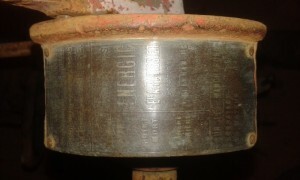 I have never seen actually Energic motoculteur G9 plaque so could only speculate that they where made from copper.